The U.S. Department of Labor defines a labor strike as “a temporary stoppage of work by a group of workers (not necessarily union members) to express a grievance or enforce a demand.” The prevalence of strike action has waxed and waned over the course of Milwaukee and the nation’s history, as particular industries have grown and prospered, or faced economic crisis and decline. While most labor strikes throughout Milwaukee history focused on wages, hours, and working conditions, in some eras issues of union recognition were more prominent. Even some lesser-known strikes reveal a great deal about the working life of ordinary Milwaukeeans. For example, massive and sometimes violent strikes for an eight-hour day swept through the nation and Milwaukee in 1886, especially at Bay View’s North Chicago Rolling Mills. Yet a year earlier, makers of iron nails (called “nailers”) at the Rolling Mills accepted wage cuts after losing a long but little noticed-strike. This prompted their helpers (called “feeders”) to strike against the nailers, because it was nailers who hired their helpers—not the company—and nailers had passed along some of their wage loss to feeders. In an 1884 strike, male printers at the Evening Wisconsin defied convention by including equal pay for women printers in their demands. In another unusual strike feature, when hundreds of cigar makers learned in 1881 that five major employers had imposed new work rules, they not only struck in protest but also opened their own Cooperative Cigar Manufacturing Company. Some strikes focused on new machinery. Coopers at the Pabst Brewing Company struck in 1899 over Pabst’s new barrel-making machines. American Federation of Labor president, Samuel Gompers, visited Milwaukee and convinced the coopers, who made barrels by hand, to end the strike, arguing that machines were inevitable and represented progress. Most leather workers were ambivalent about machinery because while machines lightened work they also made tanners work faster at lower wages. In 1892, one thousand tanners struck against five major tanneries over low wages and other issues, and in 1903 some three thousand struck against eight large tanneries whose owners belonged to an anti-union trade association. Many employers in those years were antiunion. In 1896, the local streetcar company hired hundreds of strikebreakers during a walkout and smashed the strike and the union. The company was not unionized again until after a 1934 strike, which ended tragically when a striker was electrocuted inside the company’s Lakeside power plant. In 1910, Mary Harris “Mother” Jones helped to organize mostly Polish, women bottle washers in city breweries and led a successful strike against the obstinate owners for union recognition and better wages. Machinists faced much stiffer resistance from a local branch of the National Metal Trades Association, which waged an open-shop campaign, got an injunction to stop an eight-week strike in 1901, and helped crush a closed shop strike in 1919. In the 1930s, strikes in mass production industries and the passage of the Wagner Act in 1935 expanded the proportion of the labor force that was unionized. Many of these strikes aimed at union recognition, but one strike in 1934 stemmed from racism. White workers who struck the Wehr Steel Company demanded the company recognize their union and fire all black employees. Police sided with strikers when they attacked black strikebreakers, but the company did not fire them and eventually reopened as an open shop. Other notable 1930s strikes involved different kinds of workers. In 1934, five thousand Milwaukee County public works employees struck against the Federal Emergency Relief Administration for higher wages and protection by the state’s 1911 Workmen’s Compensation Act. Several thousand women also struck for better wages at various work places, including six hundred Boston Store clerks who unsuccessfully struck during the busy 1934 Christmas shopping season. Sit-down strikes swept the nation in those years, and in Milwaukee twenty-nine of the fifty strikes in 1937-1938 were sit-downs. The longest strike in the 1930’s resulted in an unusual ordinance. Worried about the large and sometimes disorderly crowds outside the Lindemann-Hoverson stove works during a long strike, the Socialist-controlled Common Council passed an ordinance in 1935 authorizing the mayor or police chief to close a plant if the owner’s refusal to bargain with employees attracted crowds of over two hundred for two consecutive days. Socialists lost control of the council a year later and the ordinance was repealed. Strikes spread throughout the nation and Milwaukee during and immediately after World War II. The most significant postwar strike was at Allis-Chalmers (A-C) and involved struggles between communists and non-communists for control of United Auto Workers Local 248. A-C workers had unsuccessfully struck for a closed shop in 1939, and struck again for seventy-six days in the “Defense Strike” of 1941. During the violent 1946-1947 A-C strike, which focused on union security, new grievance procedures, and wages, anti-communists regained control of Local 248 and eventually won a new union representation election. While most postwar walkouts aimed at improving existing contracts, many public employees just sought union recognition and basic wage and benefit packages. In the several decades after the war, some private sector unions tried to negotiate industry-wide contracts. An early example of this in Milwaukee occurred in the seventy-six day strike against six breweries in 1953 which sought to equalize local wages with brewery workers elsewhere. Non-factory workers also sustained long strikes. Milwaukee Journal mailers and printers struck for twenty-seven days in 1961, and a strike of several hundred writers and others at the Milwaukee Sentinel in 1962 over wages, pensions, hospitalization benefits, and split shifts shut down the paper for two months. Strike action has significantly declined nationally and locally since the 1980s, as the labor movement has lost membership and fought defensive battles to maintain working class living standards. The strike that best symbolizes the plight of Milwaukee workers since the 1970s was the walkout at the Patrick Cudahy meatpacking plant from January 1987 to April 1989. Workers there had taken steep pay cuts under previous owners in 1982 and 1984, but new owners demanded more wage and benefit concessions. United Food and Commercial Workers Union Local P-40 ended the strike after it failed to buy the company during the company’s bankruptcy proceedings. Like their nineteenth-century predecessors, recent immigrants have tried to form unions to enhance their chances for better lives in America. In June 2012, workers at frozen pizza manufacturer, Palermo Villa, many of them undocumented immigrants, struck for union recognition. In November, the National Labor Relations Board (NLRB) ruled that the company had acted lawfully when it fired seventy-five employees whom it suspected of being undocumented (the union claimed Palermo did so to discourage unionization), but that the company did unlawfully fire nine other workers for supporting the strike. In June 2013, Palermo agreed to settle other outstanding issues with the NLRB. ^ U.S. Department of Labor, Bureau of Labor Statistics, Frequently Asked Questions, last accessed August 4, 2017. ^ Between the 1840s and World War I, shoemakers, ship carpenters and caulkers, cabinet makers, printers, bricklayers, plumbers, department store clerks, laundry workers, tanners, hat makers, streetcar drivers, clothing makers, brewery workers, masons, blacksmiths, freight handlers, dock workers, coopers, coal heavers, railroad workers, plumbers, upholsters, tannery workers, bakers, iron and steel foundry workers, cigar makers, and countless others struck over wage issues, to restrict the numbers of apprentices, for union recognition, to protest unsafe working conditions, and to equalize wages for women. See Thomas Gavett, Development of the Labor Movement in Milwaukee (Madison and Milwaukee: University of Wisconsin Press, 1965), 6-9, 12-13, 23-25, 36, 54, 122-123; Robert W. Ozanne, The Labor Movement in Wisconsin: A History (Madison, WI: State Historical Society of Wisconsin, 1984), 27, 31-32; Roger D. Simon, The City-Building Process: Housing and Services in New Milwaukee Neighborhoods (Philadelphia, PA: American Philosophical Society, 1996); and Gerd Korman, Industrialization, Immigrants, and Americanizers: The View from Milwaukee, 1866-1921 (Madison, WI: State Historical Society of Wisconsin Press, 1967). See also Second Biennial Report of the [Wisconsin] Bureau of Labor and Industrial Statistics, 1885-1886 (Madison, WI: Democrat Printing Company, 1886), 247-249, 254-255, and 274-276. ^ Second Biennial Report of the [Wisconsin] Bureau of Labor and Industrial Statistics, 1885-1886, 271-273. ^ On the many printers and other strikes, see Gavett, Development of the Labor Movement in Milwaukee, 24, 39-41, 51-53. See also, First Biennial Report of the Bureau of Labor Statistics of Wisconsin, 1883 and 1884 (Madison, WI: Democrat Printing Company, 1884), 140-145. The Amalgamated Clothing Workers also started its own factory in 1928 during a strike at Milwaukee’s David Adler & Sons. New York Times, April 26, 1928, p. 22. ^ On coopers: Michael A. Gordon, “Samuel Gompers, Technology, and the 1899 Milwaukee Coopers Strike,” unpublished paper; Milwaukee Journal and The Evening Wisconsin, July 12, 1899; Milwaukee Journal, Milwaukee Daily News, and Milwaukee Sentinel, August 5, 1899; Milwaukee Sentinel, August 14 and 15, 1899; Milwaukee Daily News, August 21, 1899; Samuel Gompers to the Executive Council of the American Federation of Labor, Washington, DC, August 7, 1899, in Stuart B. Kauffman, The Samuel Gompers Papers: An Expanding Movement at the Turn of the Century, 1898-1902, vol. 5 of The Samuel Gompers Papers (Urbana, IL: University of Illinois Press, 1996), 109; “The Coopers-Pabst Affair,” American Federationist VI, no. 7 (September 1899), 164; Milwaukee Journal, Milwaukee Sentinel, Milwaukee Daily News, November 11-12, 1899. Many tanners had struck in 1879 and 1886. On tanners: Many women replaced male strikers, and most tanneries granted wage increases within a few weeks. See Elizabeth A. Jozwiak, “Milwaukee Tannery Workers and the Strikes of 1892 and 1903” (Master’s thesis, University of Wisconsin-Madison, 1989), 3-7, 16-20, 25-46, 57-86. On women tannery workers, see Irene Osgood, “Women Workers in Milwaukee Tanneries,” Thirteenth Biennial Report of the Bureau of Labor and Industrial Statistics. State of Wisconsin, 1907-1908, vol. 13, part 1 (Madison, WI: Democrat Printing Company, 1909), 1028-1173. ^ Gompers said the 1896 strike was “without parallel in the labor world.” Quoted in Gavett, Development of the Labor Movement in Milwaukee, 88 (strike coverage is on pp. 85-88), 155-157; Biennial Report of the State Board of Arbitration and Conciliation for the Years 1895 and 1896 (Madison, WI: Democrat Printing Company, 1897), 11-23. See also Karen W. Moore, “Missed Connections: The Progressive Derailment of Public Transit in Metropolitan Milwaukee during the Electric Railway Era” (Ph.D. diss., University of Wisconsin-Milwaukee, 2011). ^ Michael A. Gordon, “Mother Jones, Brewery Women Bottle Washers, and Socialists: Milwaukee, 1910,” unpublished paper; Gavett, Development of the Labor Movement in Milwaukee, 118-121, 138-139; Ozanne, The Labor Movement in Wisconsin, 27. ^ The National Industrial Recovery Act (1933) gave workers the right to form and join unions but did not require employers to recognize and negotiate with unions. These union recognition strikes spread to heavy industries after the National Labor Relations Act (1935) gave additional support to union organizing, and especially after the Committee of Industrial Organizations launched massive organizing drives in major industries, at first within the AFL, and then when it left the AFL in 1938 to become Congress of Industrial Organizations (CIO). See Robert H. Zieger and Gilbert J. Gall, American Workers, American Unions: The Twentieth Century, third edition (Baltimore, MD: Johns Hopkins University Press,  2002), chapter 3. ^ Joe William Trotter, Jr., Black Milwaukee: The Making of an Industrial Proletariat (Urbana, IL: University of Illinois Press, 1985), 154-156. ^ Many strikers belonged to the Workers Committee on Unemployment, a Socialist affiliate based in Chicago. Almost daily coverage of the strike is in the Milwaukee Journal and Milwaukee Sentinel, August 14-September 12, 1934, and the Milwaukee Leader, August 15-September 19, 1934, which also has much information on the Workers Committee on Unemployment. ^ Kathryn Borkowski, “The 1934 Boston Store Strike: Sales Clerks, Union Organizing, and Community in Milwaukee” (Master’s thesis, University of Wisconsin-Madison, 1992), 1-3, and chapter 3. Several thousand other women struck against the Phoenix Hosiery Company in 1932, power laundries in 1934-35, the Gimbels department store in 1935, and the Rhea Manufacturing Company in 1934. Milwaukee Journal, October 25, 1932, pp. 1, 7; Milwaukee Sentinel, October 9, 1934, p. 3, October 21, 1934, p. 5. A wonderful account of the organizing drive at Rhea is in Rose Pesotta, Bread upon the Waters, ed. John Nicholas (New York, NY: Dodd, Mead, 1944), 183-186. On women in power laundries, see Mary Louise Obenauer, “Employment of Women in Power Laundries in Milwaukee: A Study of Working Conditions and of the Physical Demands of the Various Laundry Occupations,” Bulletin of the United States Bureau of Labor Statistics, No. 122 (Washington, D.C.: Government Printing Office, 1913). Milwaukee Journal, April 28, 1937, p. 1. ^ Darryl Holter, “Sit-down Strikes in Milwaukee, 1937-1938,” Milwaukee History 9 (June 1986): 59-61; Chicago Tribune, January 29, 1937, p. 13. ^ Gavett, Development of the Labor Movement in Milwaukee, 155-157. ^ For regular and wildcat strikes during World War II, see Nelson Lichtenstein, Labor’s War at Home: The CIO in World War II (Cambridge: Cambridge University Press, 1982), 127-135, 159-163. On the postwar strike wave, see Zieger and Gall, American Workers, American Unions, 144-152. For Milwaukee, see Richard L. Pifer, A City at War: Milwaukee Labor during World War II (Madison, WI: Wisconsin Historical Society Press, 2003), 61-66, 90-91 (on no-strike pledges), 157-158; and Darryl Holter, “Milwaukee Labor after World War II,” Milwaukee History 22 (Autumn-Winter, 1999): 96-98. 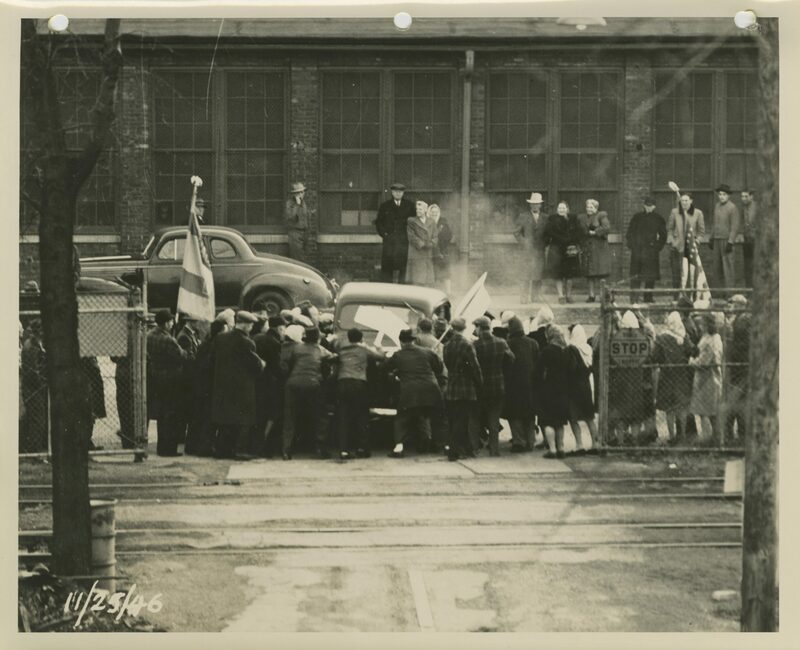 In fall 1945, there were already some 5,000 on strike in 27 Milwaukee factories. Milwaukee Sentinel, October 3, 1945, p. 5. Nationwide, there were 4,956 strikes in 1944, 4,750 in 1945, and 4,985 in 1946. Monthly Labor Review 64 (May 1947): 780. ^ Stephen Meyer, Stalin over Wisconsin: The Making and Unmaking of Militant Unionism, 1900-1950 (New Brunswick, NJ: Rutgers University Press, 1992), 72-83, 88-104, 179-183, 186-190, 207-210. ^ Milk drivers, gas workers, brewery workers, telephone operators, and others struck in 1946-1947. Holter, “Milwaukee Labor after World War II,” 96-98. ^ Transit workers struck in 1956, 1967, and 1978; police called in sick 1971 and 1981; some 10,000 county employees struck for a week in 1973; Milwaukee teachers struck for seventeen days in 1975; and firefighters struck twice in 1981 seeking pay parity with police. Transit workers: Chicago Tribune, April 14, 1956, p. 1, and April 21, 1956, p. 2; Milwaukee Sentinel, April 21, 1956, p. 1; Milwaukee Journal, April 15, 1956, p. 1; April 11, 1967, pp. 1, 6, and April 14, 1967, p. 1; May 8, 1978, pp. 1, 6. Police: Ronald H. Snyder, “‘Chief for Life’: Harold Brier and His Era” (Ph.D. diss., University of Wisconsin-Milwaukee, 2002), 41-47; Milwaukee Journal, January 24, 1971, pp. 1, 14, January 25, January 26, 1971, pp. 1, 4, January 27, 1971, p. 1; Milwaukee Sentinel December 24, 1981, pp. 1, 6. County public employees: Milwaukee Sentinel, January 3, 1973, p. 1; Milwaukee Journal, January 3, 1973, pp. 1, 24, January 6, 1973, p. 1, January 11, 1973, pp. 1, 16, which called it “The biggest public employee strike in Wisconsin history.” Teachers: Milwaukee Sentinel and Milwaukee Journal, February 5, 1975, p. 1. Fire fighters: Milwaukee Sentinel and Milwaukee Journal, March 21, 1981, p. 1. ^ On pattern bargaining, see Philip Dray, There Is Power in a Union: The Epic Story of Labor in America (New York, NY: Anchor Books, 2011), 649-650. On the 1953 brewery workers strike, see Richard A. Givens, “The Milwaukee Brewery Strike of 1953” (Master’s thesis, University of Wisconsin-Madison, 1954), 2-31. For 1969, see Milwaukee Journal and Milwaukee Sentinel, July 15, 1969, p. 1. On the Sentinel strike, see Milwaukee Sentinel, December 11, 1961, pp. 1, 10; Chicago Tribune, December 12, 1961, p. B13; Milwaukee Sentinel, May 28, 1962, p. C9. See also Michael A. Gordon, “‘Witness to History’ Interview: Kenneth A. Germanson Remembers the 1962 Milwaukee Sentinel Strike,” Milwaukee County History I, no. 3 (Summer 2010): 67-70. Oral History Interview with Kenneth A. Germanson, 2009 by Michael A. Gordon, University of Wisconsin-Milwaukee Archives. More recent strikes at various employers include production workers at Harley-Davidson in 1972, 1974, and 1991, dock workers at Continental Grain on Jones Island in 1987, Operating Engineers at the Milwaukee Center in 1988, Teamsters at ANR Advance Transportation in 1998 and Waste Management in 2008, production workers at Tower Automotive in 2003, Wal-Mart employees in 2012, and fast-food workers in 2013, who were joined in December 2014 by home care workers. On Harley-Davidson: Wall Street Journal, July 3, 1972, p. 8, September 6, 1974, p. 9, September 10, 1974, p. 43, and April 22, 1991, p. B9B. Continental Grain: Kenneth Steffels, “1986 Drop in Port Cargo Tonnage Caused by Strike,” The Business Journal 24 (March 30, 1987), 6. Milwaukee Center: Pete Millard, “Vacancies Latest Travail for Milwaukee Center,” The Business Journal 20 (July 11, 2003), A6. ANR Advance: John D. Schultz, “Teamsters Strike ANR Advance,” Journal of Commerce [New York] (December 14, 1998), 18. Waste Management: Milwaukee Journal-Sentinel, September 29, 2008, p. 4B. Tower Automotive: Thomas Content, “Tower Automotive Gives Milwaukee Unions Concessions Ultimatum,” Knight Ridder Tribune Business News [Washington], April 19, 2003, 1. Wal-Mart: Milwaukee Journal-Sentinel, November 21, 2012, p. D1. Fast-food and home care workers: Milwaukee Journal-Sentinel, May 16, 2013, p. B1, August 2, 2013, pp. A1, A10, and August 30, 2013, p. B1. ^ Michael A. Gordon, “Staging The Line: The Creation of a Play about the Patrick Cudahy Meat Packing Strike of 1987-1989,” Labor’s Heritage 9 (Fall 1997): 58-78. ^ Supported by Voces de la Frontera, a local immigrant rights organization, strikers and other supporters picketed daily at plant headquarters for months. Milwaukee Journal-Sentinel, November 22, 2012, p. B1; The Business Journal, June 30 and August 2, 2013, p. 11. Gavett, Thomas. Development of the Labor Movement in Milwaukee. Madison and Milwaukee: University of Wisconsin Press, 1965. Meyer, Stephen. Stalin over Wisconsin: The Making and Unmaking of Militant Unionism, 1900-1950. New Brunswick, NJ: Rutgers University Press, 1992.